The Lazy RR Ranch is located in beautiful Santa Cruz county, 8 miles southwest of Sonoita and 66 miles southeast of Tucson, Arizona. 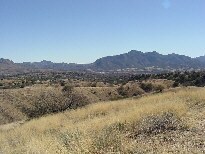 The Ranch overlooks the Sonoita Creek Valley with scenic views of the Santa Rita Mountains and Canelo Hills. The Sonoita-Patagonia area is widely recognized in Arizona for its natural beauty and world-renowned bird watching. 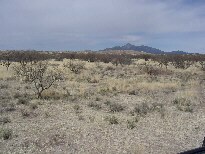 The ranch has 3 1/4 miles frontage on State Highway 82, which runs between Sonoita and Patagonia. 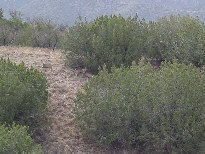 The Coronado National Forest lies on approximately 5 miles of the west boundary of the ranch. 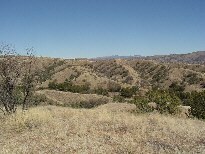 The ranch contains approximately 3,181 deeded acres. It lies between 4,400 and 4,100 feet above sea level. The small picturesque town of Patagonia (please see photo  above) located just south of the ranch offers public schools with education from kindergarten through high school. Nogales International Airport is about fifteen miles from the ranch, and Tucson International Airport is just a little over an hour's drive. 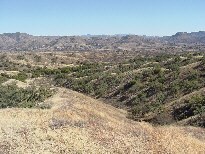 There are very few deeded ranches of this size left in southern Arizona. 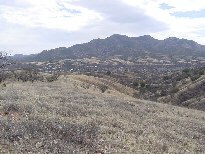 The Lazy RR is one of the last without a conservation easement, which gives it great development potential. Please see the topo map above for more information on the mining claim. Please click here to download (about 600 KB) a printable brochure in Adobe Acrobat format. If you get frustrated trying to make this work on your computer, don't hesitate to ask us to mail you a printed and bound brochure instead.